In a series of actions along the frontier between Romania and Ukraine, Lt. Gen. Hasso von Manteuffel's Panzer Division Grossdeutschland and supporting units effectively destroyed four Soviet tank corps and their supporting infantry. Five years after the war Manteuffel, known as the "Panzer Lion," would help the Allies analyse these battles. 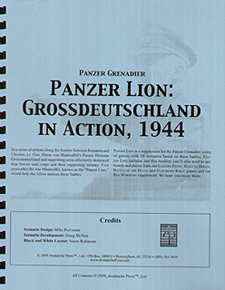 Panzer Lion is a supplement for the Panzer Grenadier series of games, with 10 scenarios based on these battles. Panzer Lion includes just this booklet; you'll also need to use boards and pieces from our Eastern Front, Road to Berlin, Battle of the Bulge and Elsenborn Ridge games and our Red Warriors supplement.